Roads and boats si extensia la Food CHAIN magnate se pot precomanda la Regat aparent, dar OMG ce sunt preturile alea? Asa de scumpe sunt jocurile de la Splotter? Nimeni nu se obisnuieste cu ele vreodata. Desi in general Splotter face jocuri uratele, grafica cartilor Food Chain nu e rea - harta intr-adevar e destul de urata, iar The Great Zimbabwe nu e rau vizual deloc. The men who built the railways arrived with sound boots and got their shovels on credit; they were issued tickets, in payment for their work, which could be spent at the Tommy Shop or (more likely) on beer! As a ganger, or foreman, you are responsible for your own team of navvies as they travel through Mid and North Wales: digging the track beds, laying the rails, and occasionally helping a passenger or two along their way. Foothills lets you participate in grand-scale railway construction while paying attention to the small details; manage your navvies’ work carefully and you should be able to let them go to the Pub at the end of the day. Using your five action cards cleverly, collect resources, remove rubble, build track and stations, and use the action spaces you unlock, all the while collecting more victory points than your opponent. In the end, the player with the most victory points wins! Ankhor is a quick-playing resource management game in which each player on their turn either collects three types of tokens (with an ankh being a supplemental resource) or buys a tile from a marketplace and adds this tile to their structure, trying to connect tiles of the same color or bearing the same scarab while doing so. By spending an ankh, you can shift tiles in the marketplace and change the cost and type of goods needed to purchase them. Each player's structure will have at most thirteen tiles, so don't wait too long to start building! 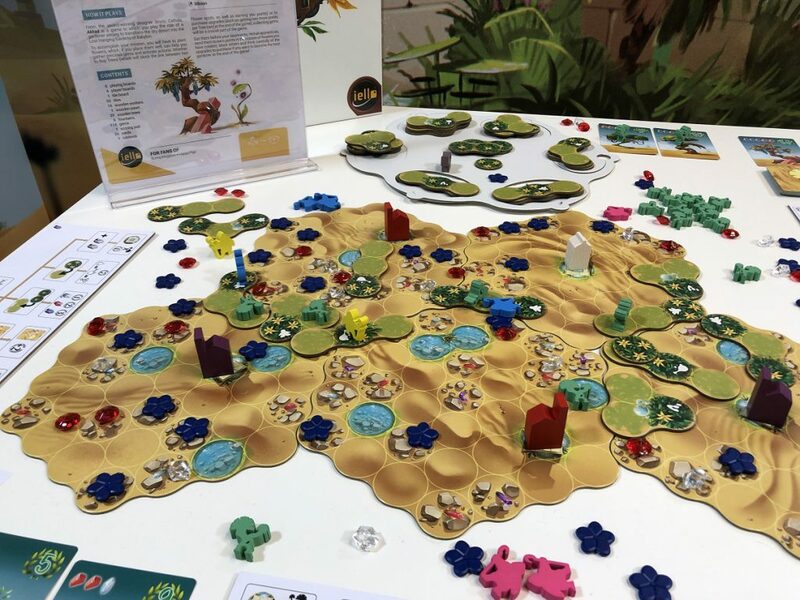 From the award-winning designer Bruno Cathala, Akkad is a game in which you play the role of a gardener aiming to transform the dry desert into the Lost Hanging Gardens of Babylon. To accomplish your mission, you will have to plant flowers, which, if you place them well, can help you gather precious gems and activate actions. Whether to buy Trees (which will block the link between two Flower spots, as well as earning you points) or to purchase upgrades (such as getting two more points per Tree card at the end of the game), collecting gems will be a crucial part of the game. Get them before your opponents, recruit apprentices, send them to earn points in the copses of flowers you have created, block others and think carefully of the upgrades to purchase if you want to become the best gardener at the end of the game! In The Quest for El Dorado: The Golden Temples, which can be played as a standalone game or combined with 2017's The Quest for El Dorado, players have now reached the legendary city of gold and they have started to explore it. What will they find there? O noua extensie pentru Pursuit of Happiness, la finalul lunii februarie pe Kickstarter. Terramara, anul asta pe Kickstarter. We hereby proudly announce our second 2019 release. This will be the 25th addition to our Masterprint series: Terramara! Terramara is designed by four designers: Virginio Gigli, Flaminia Brasini, Stefano Luperto and Antonio Tinto. They are well known for Leonardo da Vinci (our 1st Masterprint release, 12 years ago) and Egizia. Virginio Gigli and Flaminia Brasini are also known for their more recently released Coimbra and Lorenze Il Magnifico. In Terramara, you will play as the chief of a clan living in one of these villages. Your goal is to develop your clan, exploring lands farther away to trade with other villages, and reach sacred places. You improve your battle strength and discover new technologies to create useful artefacts. The player who develops the best clan by gaining more development points, will become leader of the whole Terramara and wins the game! Impression is about the history of printing. You manage your own manufacture to be the most successful in the book printing business. Involves development from Gutenberg to the present. Place a tile from the common supply to the typesetter. Now you rotate a rondel according to the number of tiles within the row and column, and the color of the used tile. Buy a tile from the typesetter. You pay as many coins as the number of the missing tiles in the chosen row and column. Get coins from the rondels. Then you can do an order fulfillment phase. You can get new orders, also you can pay resources to make progress with your actual orders. During your game you develop your own manufacture, get new abilities, collect tiles and fulfill orders. At the end of the game, who has the most victory points, wins. Wow, să le spună cineva producătorilor că e 2019. In Ascension: Skulls and Sails, players familiar with Ascension will continue to recruit powerful heroes and constructs and defeat monsters as they vie to collect the most honor. 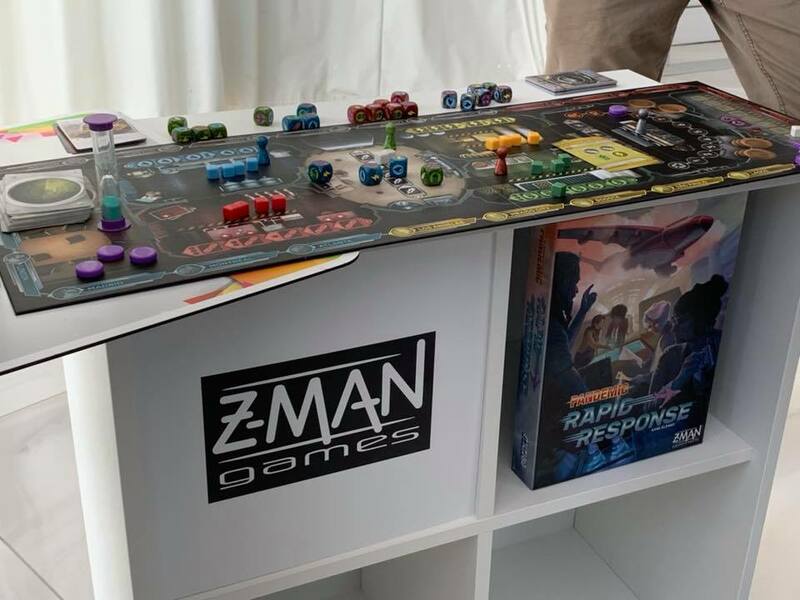 However, in addition to using runes and power to control the game, players will use a new resource, crew, to move their ship around the board map. Cast off around the board to gain an advantage over your opponents...or to challenge, Thukal, The Kraken! And what pirate adventure would be complete without raiding and treasure? Players can use the new Raid ability to capture valuable treasure cards from their opponents. Take command of your ship and join the adventure. Find gold and glory on the Severed Seas! cred ca intentia e sa-l transforme, incet-incet, intr-un soi de telenovela cu sute de sezoane in board gaming terms. noi avem trei cutii mari (si mici), prima thanks to you si e o bijuterie de joc, insa e intr-atat de bogat si "replayable" incat pe al treilea nici nu l-am incercat, nu ne-am saturat inca de primele doua. inteleg ca sunt deja 7-8 si ca scot unul in fiecare an, nu? inteleg ca sunt deja 7-8 si ca scot unul in fiecare an, nu? Este (cred) destul de greu sa mai aduci elemente noi si sa pastrezi si povestea la un nivel coerent; personal nu gust deloc tema (pirati, bleah), dar din putinele informatii disponibile, pare a fi un set construit pe ideea de confruntare directa intre jucatori, idee care-mi place mult.